My favorite season of the year has finally arrived! I love everything about fall...the changing leaves, the crisp air, the comfy sweaters and most of all, the flavors of the season. I'm talking cinnamon, pumpkin and of course, apples. I had the chance to go apple picking this past weekend and came back with nearly a 1/2 bushel of apples - a mix of MacIntosh, Jonathan, Stayman and Golden Delicious. When I returned with my haul of apples, I knew exactly which recipe I wanted to try first. I came across a recipe for Apple Dumpling Slices via King Arthur Flour. I liked the twist on a traditional apple dumpling and it reminded me of my favorite blackberry cobbler recipe. The instructions may seem complicated (you are making 3 separate elements) - but everything comes together quite easily. This cobbler (as I like to think of it) is delicious hot out of the oven or at room temperature, with ice cream or without, with a fork or with your fingers. Anyway you look at it, this is a delicious way to enjoy the flavors of the season! Pour melted butter into 9x13 pan and spread evenly across the bottom. Set aside. In a small saucepan, heat apple cider and sugar until sugar is melted and mixture is clear. Set aside. Mix chopped apples with cinnamon. Set aside. In a large bowl, add flour and cut in cold butter until mixture is crumbly. Add milk and mix just until dough comes together. Knead gently until dough becomes cohesive. Roll out dough into a 10x15 rectangle on a lightly floured surface. Sprinkle chopped apples over entire surface of dough. Arrange each slice on top of the melted butter in the prepared pan. Pour the apple cider syrup over top of all the slices. Bake for 40-45 minutes, until lightly browned and the syrup is bubbly. *Note: To substitute for 1 cup self-raising flour, add 1 1/2 tsp baking powder and 1/4 tsp salt to 1 cup all-purpose flour. Can you believe that O-YUM-G is now 3 years old? Time sure flies when you're baking fun! Since this blog was founded on St. Patrick's Day - I honor the anniversary with a St. Patrick's Day-related treat! The blog first started with shamrock cookies decorated with royal icing. The following year were easy-to-assemble pretzel shamrocks and last year I shared a recipe for mint chocolate chip cookies. This year, I give you these marble glazed shamrock cookies! They are as tasty as they are pretty. And the glazing technique is easier than you would think. I also recently came across a fantastic sugar cookie recipe that has surpassed the tried-and-true sugar cut-out cookie recipe I've been using for the past 17 years. It's THAT good. Using a hint of almond extract and high-quality butter sends the flavor of this cookie through the charts. You don't even need to make them look pretty in order to enjoy them (I actually prefer them plain!). The best part of this recipe is that you don't need to chill the dough first in order to roll it out and cut out cookies. That means you can get homemade cookies in your mouth all the faster! Preheat oven to 350. In bowl of stand mixer, cream butter and sugar together about 3 minutes, scraping the sides of the bowl as needed. Add in extracts and egg and mix well. Slowly add in baking powder and flour until just incorporated. If mixture is a little dry, finish mixing by kneading the remaining dry ingredients into the dough with your hands. Divide the dough into thirds and roll out onto a well-floured surface to about 1/4" thick. To ensure even thickness, place dough between two 1/4" dowels and run rolling pin over the dowels until all the dough is flattened and even. Cut out into desired shapes. Repeat with remaining dough. Place cookies about 1" apart on an un-greased cookie sheet. Bake for 6-8 minutes - just until set. Do not overbake - you don't to see any browning. Let cool on the pan for 2-3 minutes before removing to a cooling rack. Let cool completely before frosting/decorating. In a medium bowl, whisk together the powdered sugar, vanilla, almond extract and 3 Tbsp of milk. Add additional milk by the teaspoon, until it's a thick but drizzle-y consistency. Pour about 1/4 of the glaze into a shallow bowl. Place 4-5 drops of food coloring onto the glaze and drag a toothpick through the glaze in a swirl formation to create the marble-effect. If using the gel kind of food coloring, dip end of a toothpick into the gel and then swirl through the glaze. Take a cookie and place it top-side down onto the glaze. Gently press down so that the glaze touches the full surface of the cookies. Carefully lift the cookie straight up from the glaze and let any excess drizzle off. Flip cookie right-side up and place on a cooling rack to let the glaze set. When the glaze in the bowl has lost most of its marble-effect, add another 1/4 of the glaze and swirl in additional food coloring. Repeat with remaining cookies and glaze. Let the glaze set for about 1-2 hours. They can then be stacked between sheets of wax paper and stored in an airtight container. It's beginning to feel a lot like autumn...all through the town... Not quite the same ring as the traditional Christmas tune, but we've finally reached that phase in the seasonal calendar where the leaves start to fall, there's a crispness in the air, the sweaters and boots come out and the apples are ready for picking. I recently went apple picking and came back with a bunch of apples waiting to be turned into various treats. And then today, I found this recipe for a caramel apple pie. The recipe came via King Arthur Flour and a local baker who won first place in the county fair. It had so many things going for it: 1) buttery crust 2) caramel sauce 3) streusel topping AND 4) a lattice crust top. And my goodness did it deliver! I probably could have gone with baking it a little bit longer for a crisper bottom crust (it was a tad on the "soggy bottom" side) - but still crazy delicious. If you're thinking ahead about your Thanksgiving menu or are just hankering for a good slice of apple pie - you should definitely check this recipe out! 1. To make the crust, mix flour and salt together and cut in butter with until mixture resembles coarse crumbs. Add enough of the water so that the dough comes together. Divide the dough into two amounts, one slightly larger than the other and flatten into a disc. Wrap each disc in plastic wrap and refrigerate for 1 hour. 2. While the dough is chilling, peel, core and slice apples and place in a large bowl. Add sugar, flour and cinnamon. Toss to coat. Melt half of the caramel bits with the cream and stir until smooth. Pour over the apples and toss to coat. Set aside. 3. For the topping, mix together flour and brown sugar (you can use the same bowl the crust was made in) and cut the butter in until the mixture is coarse and crumbly. Set aside. 4. Preheat the oven to 375. Remove the dough discs from the fridge. Unwrap the largest disc and place on a floured surface. Tap the dough with rolling pin to soften the disc and make it pliable for rolling. Roll dough out into a large circle and place in a 9" pie plate. Sprinkle the bottom of the pie crust with the panko crumbs (these will help absorb some of the juices to prevent a soggy bottom). Place the apples in the pie crust, reserving the liquid. Cover the apples with the streusel topping. Roll out the remaining dough disc and cut into strips. Arrange on top of the pie in a lattice design of choice. 5. Place on top of a parchment or silpat lined baking sheet and bake in oven for 60-70 minutes. If crust is looking too brown, cover with foil for remainder of the baking time. 6. While the pie is cooling, place reserved apple liquid into a small saucepan. Reduce liquid until thick and glossy. Add in remaining caramel bits and cook over low heat until caramel melts, stirring constantly. Add milk or cream for desired consistency. 7. To serve, cut pie into slices and drizzle with caramel sauce. Enjoy!! As with the original series, the reboot of MacGyver features a government operative with a special knack for unconventional problem solving- he was the ultimate "life-hacker". Rather than share some recipe pairings - I figured it would be most appropriate to share with you my favorite kitchen hacks - so you can become your own MacGyver of the kitchen! Use a plastic ziploc bag as a quick pastry bag. Whether piping frosting or drizzling melted chocolate, fill the bag, zip close and cut the tip of one corner to the desired size opening. Got an egg shell in your bowl? Wet your finger with water and the egg shell will cling to your finger! Spray your pans with non-stick spray over your opened dishwasher door. Any excess spray will land on the door and not your counter or stove top - and you'll be washing that door anyway, the next time you run a load of dishes. Use a cookie or ice cream scoop to portion out equal sized amounts of cookie dough or muffin/cake batter. If a recipe calls for oil, make a healthy swap for an equal amount of applesauce. To quickly get eggs to room temperature (as often called for in recipes), place them in a bowl of warm water. By the time you've gathered your other ingredients and ready to use the eggs, they'll be at the perfect temperature. MacGyver airs Fridays at 8p on CBS. Today has been a fun day - it's where my professional and personal passions have come together...in a cake! 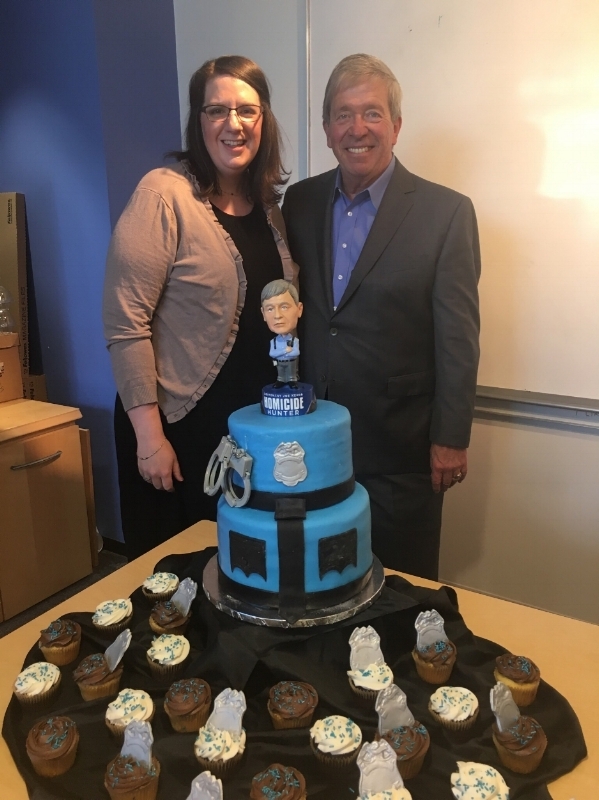 We had the pleasure of hosting Lt. Joe Kenda at the office today - to help kick off a new season of Homicide Hunter, which (shameless plug) premieres tonight at 10p on Investigation Discovery! 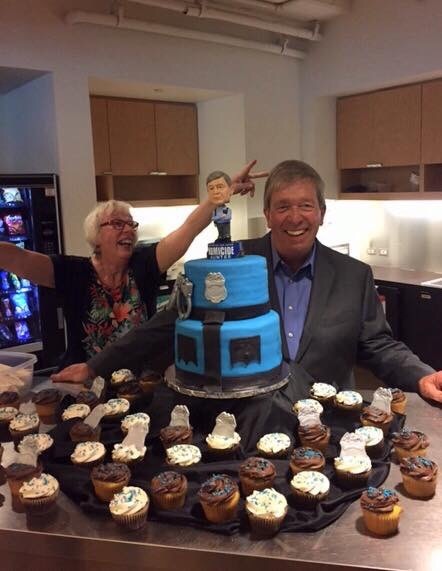 To mark the special occasion, I made a special cake for Kenda - a two-tier, 20+pound creation representing a police officer's uniform and including a few special ID touches: the ID logo and Kenda's catch-phrase "my, my, my" on the back and a talking Kenda bobble-head as the cake-topper. The bottom tier was a 4-layer chocolate cake with chocolate buttercream and the top tier was a 4-layer yellow cake with vanilla buttercream. I had a lot of fun making this cake and it was extra special to share it with Joe, his wife Kathy and the rest of the ID team. And I think folks had a lot of fun eating it, too! I don't know about you, but I've had so much fun watching the Rio Summer Olympics these past two weeks. We've had some incredible stories and wins for the American team - and for Team Maryland! Having visited Rio three years ago, one of the draws of watching this year's coverage of the games was seeing the stunning scenery in Rio and remembering my trip there. Another way to remember my trip was to make some Brazilian treats - which I shared with friends at an Opening Ceremonies party. The treats included Pao de Queijo (cheese buns), brigadeiro (a Brazilian chocolate candy) and caipirinhas (cocktails made with cachaca). These classic Brazilian recipes are pretty easy to make and most of the ingredients can be found at your local grocery store. So as the Olympics come to a close tomorrow night, raise a caipirinha and take a bite of brigadeiro to say "Obrigado, Rio"! These buns are naturally gluten free and made with tapioca flour. They're flavored with garlic and cheese and best served warm. They're great on their own as a snack or served as a dinner roll or as a side to a salad or cup of soup. These delightful chocolate confections are a cinch to make and only require 3 ingredients! They're a rich and smooth truffle-like candy that are then rolled in chocolate sprinkles (or rainbow ones if you're feeling extra festive). Add all ingredients to a medium saucepan and mix to combine. Stirring constantly, cook over low heat for about 10 minutes or until a spatula dragged through the middle of the mixture reveals the bottom of the pan and the mixture stays separated for 2-3 seconds. Pour onto a sheet pan lined with parchment and chill for 1hr. Roll into teaspoon-sized balls and roll into sprinkles. Buzzfeed recently came up these other variations on this theme - I'm excited to try out the cookies & cream version! Whether on the beaches of Copacabana or island hopping in Paraty, one thing we could always find was a fresh caipirinha. This cocktail is just about perfection - bright lime muddled with sugar and topped off with ice and cachaca, a white rum distilled from sugarcane. They can be strong but they are so refreshing on a hot day. Muddle the limes and sugar in the bottom of an old-fashioned glass. Add enough crushed ice to fill to the top and top with the cachaca. Makes one drink. One of the best (and strongest) caipirinhas we had in Brazil - made by a little old grandma! Today was the last day of our pastry class and while I'm sad it's over, I'll be glad to get home to my kitchen and try these recipes all over again! On the agenda for today was chocolate, nuts, more chocolate and buttercream! First, we made nut dragees, which are like a fancy version of M&Ms. 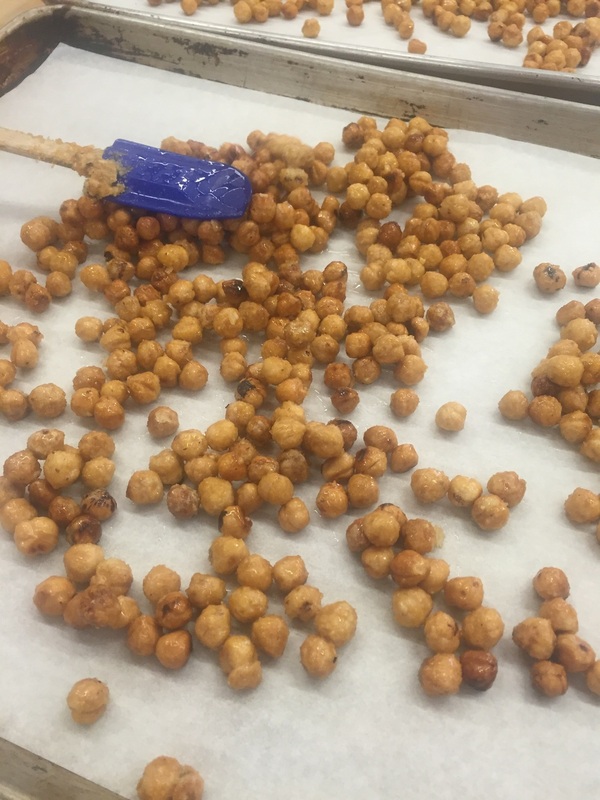 Our instructor, Melanie, selected hazelnuts for us, but you can use any round nut like hazelnuts, macadamia nuts or almonds. Nuts like pecans and walnuts get a little trickier because of the nooks and crannies. When you're working with nuts, it's always a good idea to toast them first. This really brings out the nuttiness and flavor. If your nuts have skins on them, you'll need to remove the skins first before coating them in sugar and chocolate. Next, you make a light caramel (from sugar and water), coat the nuts evenly with the caramel and then spread out on a pan to cool. As they cool, break them apart so each one is separated. Now comes the fun, magic part! To get the nuts perfectly enrobed in chocolate, you get three metal bowls that have been in the freezer. Pour nuts into the first bowl and then pour a ladle full of chocolate over them. Stir the mixture until the chocolate sets and the mixture looks dry - none of the nuts should be clumped together. Then transfer the nuts to the second frozen bowl, add chocolate and repeat the process. Keep going through the third bowl. Transfer the nuts to a pan and return the three bowls to the freezer to chill again. Once they're cold, repeat the chocolate coating process three more times, moving the nuts from one bowl to the next. When all the nuts have been coated, you can start eating them just as they are or tossing them in confectioners sugar or cocoa powder. Before we started making our truffles, Melanie gave us a quick history of chocolate and shared with us some pictures from a trip she took to a Mexican cocoa plantation. We learned that cocoa beans are harvested from ripe, red pods that are about the size of a football. The beans are then laid out in the sun to ferment, then dried and roasted. The outer shells of the beans are cracked and discarded, leaving the "nib" of the bean. Those nibs are then ground to produce cocoa liquor which is further processed to make cocoa powder and chocolate bars. Now back to our truffles! 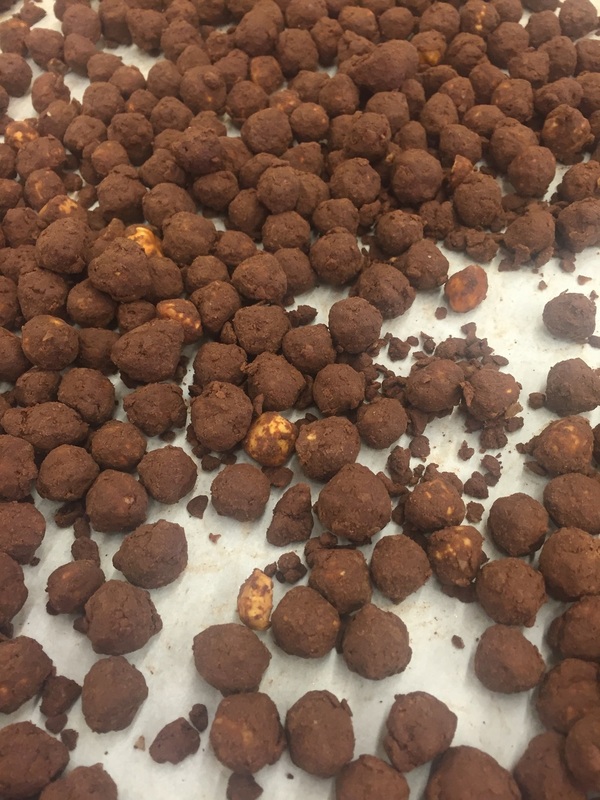 Once we had them scooped and rolled into balls, we had to temper some chocolate to use to cover our truffles. Tempering is a process of heating and cooling chocolate to specific temperatures in order to stabilize the cocoa butter crystals. This ensures a shiny and smooth consistency when fully cooled. There are several methods of tempering, the easier methods being the seeding method and the table method. The seeding method involves heating your chocolate to the appropriate melting temperature and then cooling it to the correct working temperature by adding in small amounts of chopped, tempered chocolate to the bowl ("seeds"). By adding room temperature chocolate, it helps to naturally cool the mixture to the working temperature. Another method of tempering chocolate is the table method. Just like in the seeding method, the chocolate is heated to melting temperature, but instead of cooling it with solid chocolate, the chocolate is poured onto a marble or granite slab and spread around with metal utensils. This method does have the potential for a lot of mess, but looks like such fun! Our instructor, Melanie, tempering chocolate via the table method. Once we had our tempered chocolate ready, it was time to coat the truffles. Melanie showed us an ingenious method for dipping truffles in chocolate. Wearing gloves, dip three fingers into the chocolate and transfer a good amount into your other hand's palm. Then place a ball of ganache in your hand and roll it in the chocolate in your hands. This method allows for a thinner and more even coating of chocolate and less of a puddle when you set the chocolate ball on a pan. The other benefit is that you don't cool down your melted chocolate by dropping chilled balls of ganache. Note the near perfect round shape and cleanliness of Melanie's truffles and pan! 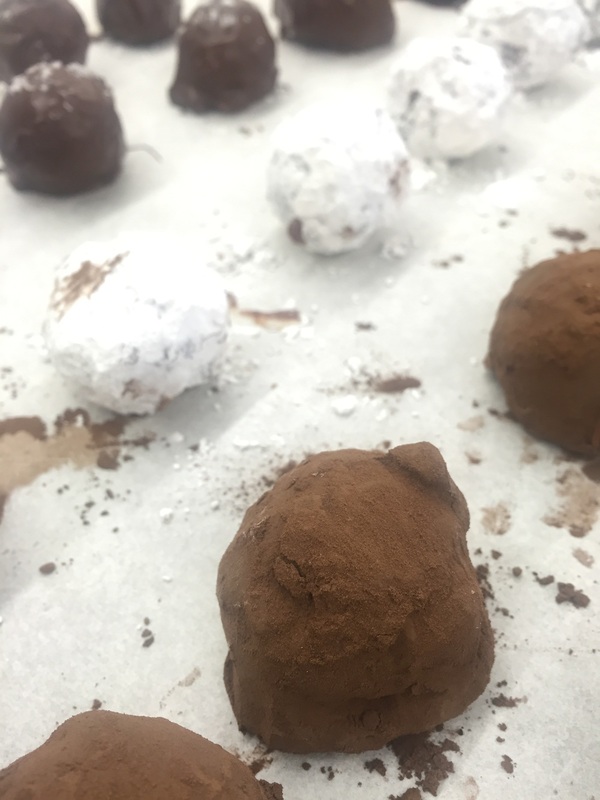 We soon found out that practice really does make for better looking truffles. Ours were not so round and clean. Part of the issue was that we made our ganache with predominantly milk chocolate and we should have reduced the amount of cream we used to compensate for the milk in the milk chocolate. Since we didn't, we had a much softer ganache, which made for somewhat difficult rolling and coating of chocolate. But still tasty, nonetheless!! But once they were gussied up in cocoa powder, powdered sugar or sprinkled with sea salt, they don't look so bad! All of our chocolates packaged up! The last thing to do before the class ended was to assemble and decorate the other vanilla chiffon cake. First step was to slice the cake into two layers. We also had one-half layer leftover from when we made the parfait on Day 2, so I decided to make mine a three-layer cake. I also chose to fill each layer with the leftover lemon curd from our lemon tartlets on Day 1. Then we used a small amount of frosting to create a crumb coat and then chilled the frosting to set it. Finally, we put the finishing layer of frosting on the top and sides of the cake and smoothed it out. Then we put the remaining buttercream into a pastry bag fitted with a star tip and piped out decorations to finish our cake. The final three-layer vanilla chiffon cake with lemon curd filling! Mom and me with our decorated cakes! Once our cakes were done, we had a little "graduation" ceremony where we presented with certificates of completion and then we took a class photo with our instructor Melanie. KAF Pastry II - Class of 2016! It's been such a wonderful week being here at King Arthur. I've loved being able to share this experience with my mom and to be in the company of fellow bakers who have a passion for creating homemade treats. I can't wait to come back for another bake-cation and try my hand at more new recipes and techniques! Thanks to you all for following along on our journey - keep coming back to the blog for more posts on my adventures in baking! Well, our week is now half-way over but there's still so much deliciousness to get to! Now that we reached day 3 - it was time to finally prep our puff pastry for baking. 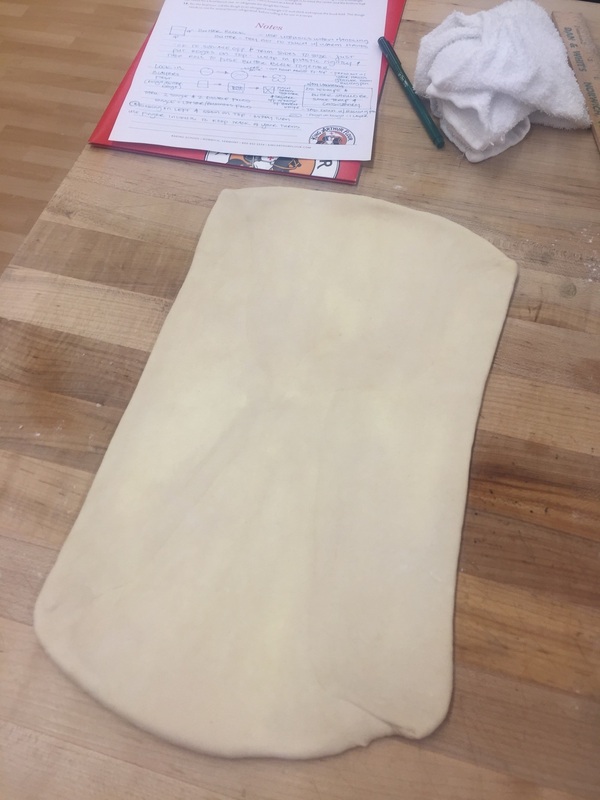 We rolled it out into a giant rectangle and then docked it with this fancy roller that gently poked the dough. Docking helps steam escape and prevents giant bubbles from forming when in the oven. The docked puff pastry dough, prior to baking. As with all the other steps in puff pastry, we needed to chill it one last time before baking in the oven. While we were waiting for that to happen, we turned our attention to the assembly of the Sacher tortes. First, we had to make the chocolate glaze that was going to cover the entire cake. It was surprisingly easy and with only two ingredients: chocolate and boiling water. 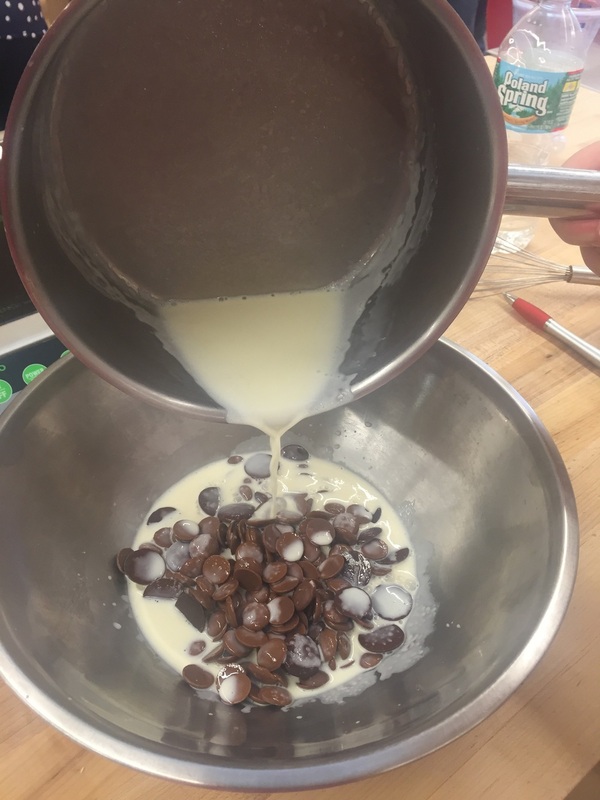 Today's instructor, Becca, made a big batch for the entire class to use, and because of the large amount, she used an industrial-sized immersion blender. Normally, you wouldn't ever mix chocolate and water, but because of the power of the immersion blender, we're able to create an emulsion where the water droplets become dispersed throughout the chocolate and a glossy glaze is formed. Industrial-sized immersion blender in a bucket of chocolate glaze. 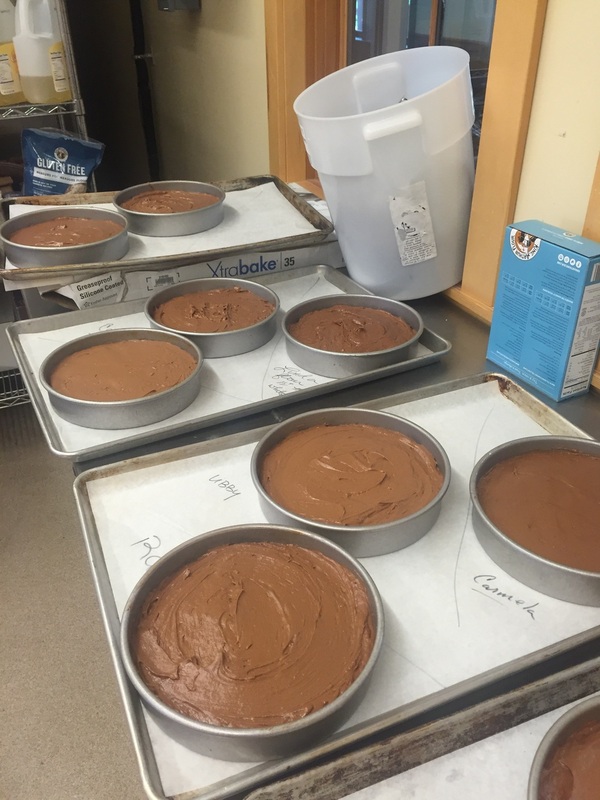 Once we had the glaze prepared, it was time to assemble our Sacher tortes. First, we had to split the cake into two layers and cover the bottom layer with apricot preserves - the hallmark ingredient of a traditional Sacher torte. Then we poured that sumptuous chocolate glaze onto the top of the cake and with a spatula, evenly spread it across the top and along the sides of the cake. Another pastry down, it was time to start the prep on our next creation: chocolate truffles! 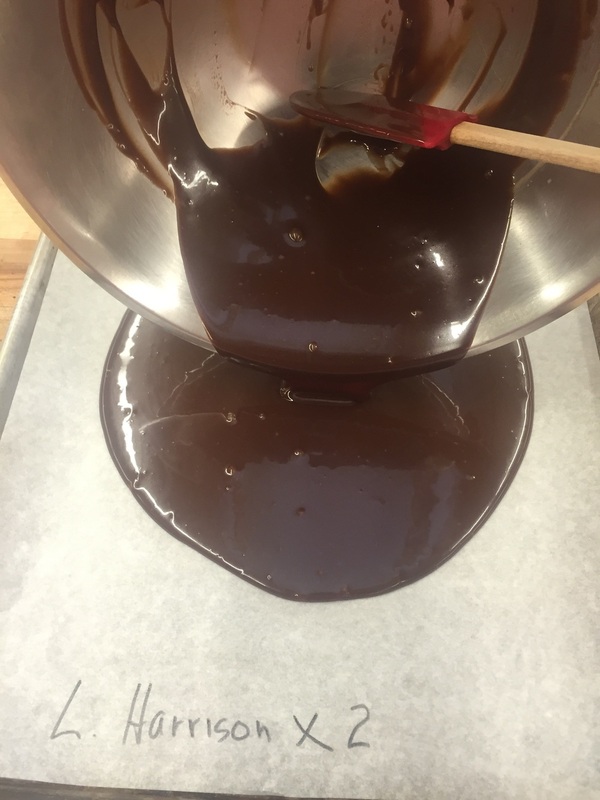 The step we were tackling today was the ganache. So we heated up some milk and honey and poured it over a mix of milk and dark chocolate chips. It's perfect! And now we pour onto a sheet pan, cover it with plastic wrap (to keep a skin from forming) and let it chill in the fridge until we're ready to work with it tomorrow. Our chocolate ganache - Mom (Linda) and I will be sharing this batch, so we labeled with our name...times two! While we were making our chocolate ganache, our puff pastries were baking and cooling. And ta-da! Isn't it beautiful?! So flakey, so buttery, so golden-y! Some of you may be thinking, "umm...where's the puff"? Don't worry, the layers are there - but we actually inhibited a full on puffing by placing another sheet pan directly on top of the dough. This ensured that the pastry would rise evenly. And because we were going to be slicing this and layering it with pastry cream, we didn't want the pastry to be too thick (or else it'd be extra hard to eat). So here's the pastry cut into thirds in strips and the bottom layer covered in a layer of piped pastry cream. We put the middle layer on, piped another layer of pastry cream and then topped it with the final layer of puff pastry. Then we decorated the top with a layer of white icing and stripes of melted chocolate. To make a pretty design, we dragged a toothpick across the top in alternating directions. And voila! A finished Napoleon! The last step was to put it in the fridge to let the icing set before slicing it into individual portions. One of the key things we've learned this week is that pastry is really all about the assembly of multiple components, many of which, take time and patience. After working on a number of elements over the past few days, the actual final assembly of our desserts came together rather quickly and today we completed our Napoleons and Sacher tortes. The last task of the day was to make Italian meringue buttercream to be used in the assembly and decoration of our vanilla Chiffon layer cakes. An Italian meringue buttercream starts with water, sugar and corn syrup, heated to the soft ball stage (238 degrees). Meanwhile, you whip egg whites and sugar into a meringue. Once the hot sugar mixture is ready, you stream it into your bowl of egg whites and proceed to whip until the bowl is no longer hot and feels about ready. 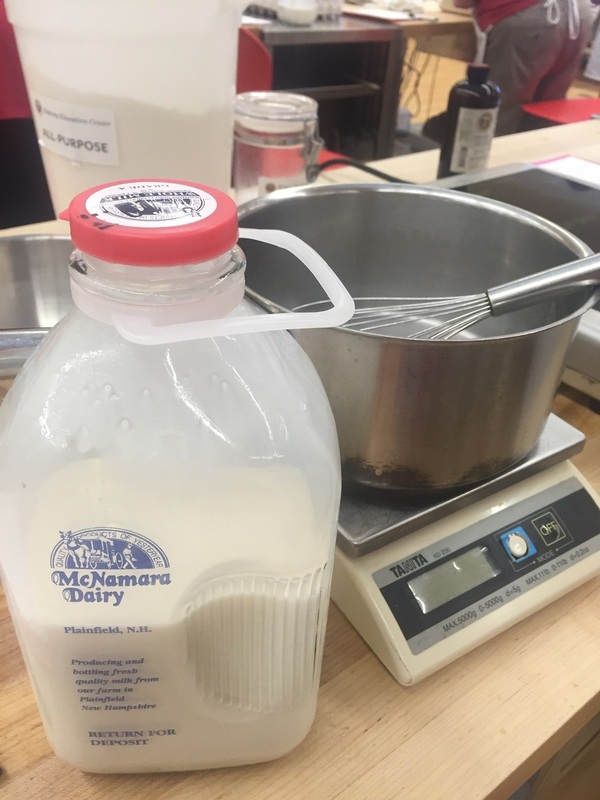 Our instructor had us make a giant batch for the entire class, so we used a commercial-sized stand mixer with a 20-quart capacity. After we had incorporated about three-fourths of the hot sugar mixture, our bowl was nearly filled to the brim...we're going to need a bigger mixer! Though our 10 POUNDS of butter was ready and waiting, we were running out of room in our mixer bowl! Fortunately, an even bigger mixer was in the commercial pastry kitchen next door - so off we went on a field trip! But first, we needed to put on hairnets, since we were entering a commercial space where food was being made for public consumption. 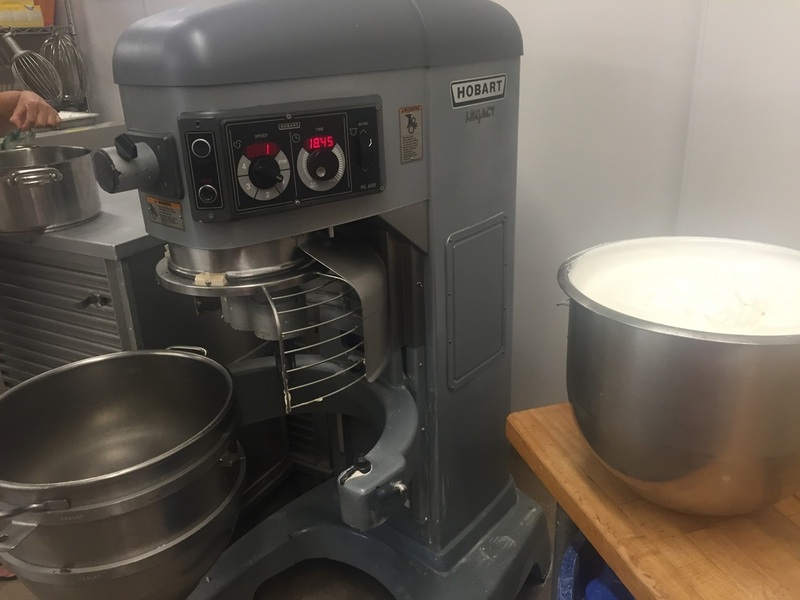 We quickly became friends with this lovely 60-quart mixer which was plenty large enough to accommodate our big batch of buttercream. So once we were back in action, we finished adding the rest of our hot sugar mixture to the meringue. Once the bowl felt cool enough, we slowly added giant pats of softened butter and let the mixture whip until it was light and fluffy. Finally found a mixer big enough for the job! Our finished batch of Italian meringue buttercream. Before we left the commercial pastry kitchen, we got to have a little tour and a peek into one of the walk-in refrigerators. The walk-in fridge that is bigger than most walk-in closets! Panoramic view of a professional pastry kitchen! So now Day 3 is a wrap and we've got just one day left. Tomorrow, it's all about chocolate and cake decorating...can't wait! After four years away, I'm finally back at King Arthur Flour for a four-day baking "camp" or "bake-cation" as a fellow student called it! This time, it's all about pastry, and I brought my mom along with me! We arrived at King Arthur's beautiful campus a bit early to scope out their store and grab a bite to eat in the cafe before class began at noon. We were then greeted by our instructor Melanie and her co-instructor Sharon and got settled into our work stations. First on the agenda was to make a tender tart dough that was going to be the base for some lemon tartlets. When making dough for tart crusts, you can either take the fresh dough and press it into the tart or chill the dough for about an hour, roll it out and then form it into your tart pan. Since we were going to be making two 4-inch tartlets, I decided to give both methods a try and then compare and contrast as we went along. Pressing in the tart crust! Once our dough was chilling, we moved on to the next recipe: a vanilla chiffon cake. We learned that, unlike most pastries, which have their origins in Europe, the chiffon cake is purely an American invention and was developed in the 1920s. It combines the essence of a sponge cake and an oil cake so that you get the lightness of a sponge with the tenderness of an oil cake. Aerating and lightening your ingredients is important at nearly every stage. Dry ingredients are sifted twice to ensure even distribution of the ingredients and to aerate them for lightness. The egg whites are whipped to stiff peaks and the added sugar helps aerate the egg whites into a perfect meringue while the cream of tartar provides stabilization. Side note: learned the fascinating history of cream of tartar - it comes from the crystals that grow in wine casks and is then ground into a powder after fermentation! Mom really knows her sift! 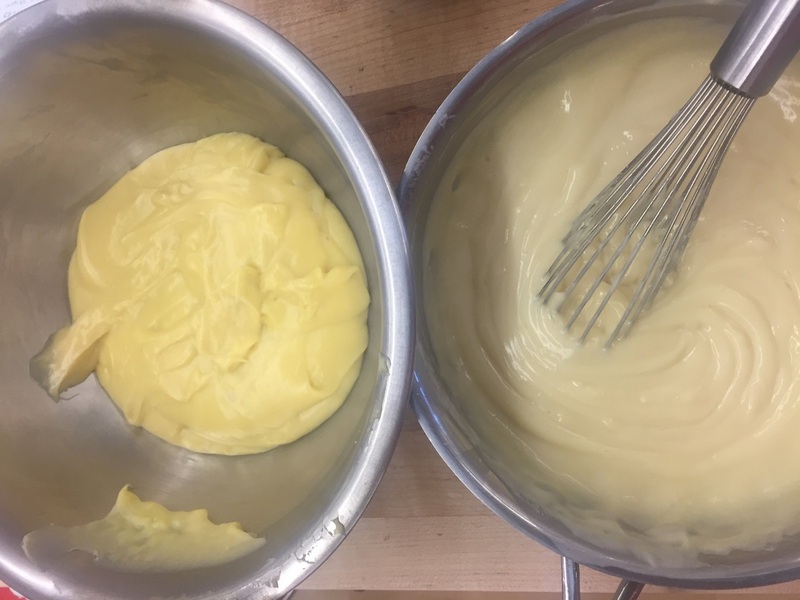 Once we had our dry ingredients mixed with some oil, egg yolks and vanilla, we carefully folded in the egg whites until we had a nice thick batter and then divided into two cake pans. They were baked in a walk-in oven (at least 6 people could fit in there, if you tried!) and were set aside for us to use in other recipes on Day 2 and Day 4. Chiffon cakes ready to bake! After the chiffon cake, we started in on puff pastry. Traditionally, a well-made puff pastry takes THREE days to make! We started with just the first part, the dough or the "le detrempe". We started with 3 simple ingredients: flour, salt and butter. We worked the butter into the flour and then added cold water to form the dough. This is a similar process to making biscuits, scones or pie crust. But then we kneaded the dough to form more of its gluten structure. Once we had our ball of dough - off to the fridge it went to chill overnight - we'll see it again tomorrow. Then it was back to our tartlets - this time to prep them for blind baking (a fancy way of saying we're going to bake the crust without any filling). But in order to make sure the dough doesn't puff up in the middle or slide down the sides, we filled them with beans to help keep the dough in place. The crusts were baked with the beans for about 8-10 minutes and then removed and back in the oven for another 8-10 minutes, until fully baked and the edges and bottoms were browned. Baked tartlet shells - ready for filling! Last, but not least, we made our lemon curd filling. I've tried making lemon curd before - and to not very great result. So I was eager to learn the secret to a good lemon curd. Turns out it's patience and quite a bit of butter. The curd was made with fresh lemon zest and lemon juice along with some sugar and eggs. It was then cooked over a double boiler until the egg mixture reached 175 degrees and just started to thicken. Then the bowl was removed from the heat and we started adding in 6 ounces of cold butter, one cube at a time. It probably took about 10 minutes to get all of the butter added in and fully melted and incorporated. Then we poured the curd into our shells and let them set up in the refrigerator before decorating with some fresh whipped cream and local, hand-picked blueberries. Come back tomorrow to see what we learned on Day 2! It's berry season and one of my favorites because of all the delicious ways you can use berries. I recently went blueberry picking and came home with a big bucket of blueberries. I ate some, froze a lot and baked with the rest! I love making pie and what's better in the summertime than a blueberry pie? So I did a little research and settled on a blueberry custard streusel pie. I liked the idea of a custard-based pie as it would add a little more stability and flavor to the filling. And who doesn't love a crunchy, nutty, streusel? This was a delicious pie and a recipe that I'll keep on file for the next time I have a bucket of berries! The only change I would make is to blind bake the pie crust first to ensure a fully baked bottom (mine was slightly underdone). To make the crust, mix flour and salt in a large bowl. Add shortening and using fingers, work the shortening into the flour until resembles pea-sized crumbles. Add enough water to make the dough just come together. Turn out onto a floured surface and roll about 1/8th inch thick. Transfer to a pie plate and crimp crust as desired. Line the pie crust with a piece of foil and add ceramic pie weights or dried beans (these help keep the crust from creating bubbles and the sides from sliding down). Blind bake in a 425 degree oven on the middle rack for 15-20 minutes or until the crust is just turning golden. Remove the foil and weights and return crust for about 5 minutes or until the bottom of the crust looks dry. Remove from oven and let cool. Reduce oven temperature to 400 degrees. While the crust is cooling, prepare the filling. In a large bowl, whisk together sour cream, sugar, egg, flour, vanilla and salt. Gently fold in the blue berries. Pour into the crust shell. Cover the edges of the crust with foil (to prevent burning) and bake for 25 minutes. While the filling is cooking, prepare the streusel. In a small bowl, mix together brown sugar and flour. Work in softened better until you have coarse crumbles. Add in the chopped pecans. After the filling has baked for 25 minutes, top the pie with the streusel topping and return to oven for an additional 15-20 minutes or until the pie is set and the streusel is browned. Let the pie cool for at least 15-20 minutes and serve warm or refrigerated and serve chilled. Enjoy! If you happen to have lots of blueberries like I did and want another pie-in-the-sky idea...here's another pie recipe! This recipe was featured on the cover of Southern Living a few years ago and it looked so tempting, I had to make it. The secret ingredients? Honey and balsamic vinegar! Though I would consider adding a splash or two more of the vinegar, as once the pie was baked, you couldn't really taste the balsamic - but you could taste that it was a tasty pie! And I can't resist the look of a beautiful lattice crust. Find the recipe here. In the summertime, cool cocktails are a must, especially when faced with hot, humid nights. My solution is to make a pitcher of this super easy, super tasty summer sangria! It all starts with one of my favorite wines, a sweet shiraz by Jam Jar. Add some fresh strawberry puree, orange juice and a little triple sec and you've got yourself a winning concoction! In a large pitcher, add wine, orange juice, strawberry puree and triple sec. Stir. Add in fresh sliced strawberries and blueberries. Chill in refrigerator until ready to serve. Add additional fresh fruit per glass, as desired. Baking Club Adventure: Cookie Exchange! One of the things the members of the baking club told me when I first joined, was that they did an epic Christmas cookie exchange every December. Each member would make four dozen of four different kinds of cookies...that's 16 dozen cookies...per person!! Needless to say, I was excited and intrigued and started making my list of cookies I wanted to make last June (hey, it's never too early to think about Christmas!). When December finally came, I took off a day of work just so I could focus on baking cookies - and it was a delightful vacation day, well spent. The day started with an 8:30am showing of the new Star Wars movie, a stop by one of my favorite Mediterranean restaurants for lunch to go, and then an afternoon in my kitchen with Christmas music playing in the background. Heaven. Keep reading for all of our cookies and some recipes! I love pecans but am generally not the biggest fan of pecan pie. The ratio of crust to pecans to sweet, gooey filling is all off for me. There ends up being way too much of the gooey stuff and I can really only take a bite or two before it's too much. But these bars are a game-changer. A thick, slightly sweet crust is the base for the perfect blend of filling and pecans. There's just the right amount of each component - and I dare you to eat just one! Grease bottom and sides of a 10x15x1 inch baking pan (a half sheet or jelly roll pan will also work fine). Prepare crust: In large bowl with mixer at medium speed, beat flour, sugar, butter and salt until mixture resembles coarse crumbs. Press firmly and evenly into the pan. Bake in 350 oven for 20 minutes. While crust is baking, prepare filling: In large bowl, stir eggs, corn syrup, sugar, butter and vanilla until blended. Stir in pecans. Spread evenly over hot crust. Return to 350 oven and bake for 25 minutes or until set. These cookies are a variation on a shortbread recipe my mom received from a friend back when we were living in Germany in the 1980s. It called for rice flour before that ever became a common ingredient you easily find in the regular grocery store. We often would replace the rice flour for another cup of regular flour - which never affected how quickly they were eaten! Since the shortbread is cut into 1" squares - it makes for a lot of cookies (up to 16 dozen) - and perfect for a cookie exchange or to give as gifts! In the bowl of a mixer, cream butter and add sugar. Slowly add in flours and then the rosemary and lemon rind. Pat in a half sheet or jelly roll pan. Pre-cut the shortbread into 1" squares and prick each square with the tines of a fork. Bake at 325 for 40-50 minutes until light golden brown. Sprinkle with sugars (I either use clear sparkling sugars or seasonal red & green sanding sugars.) While still warm, re-cut and prick the squares. Variations: Instead of rosemary & lemon add: 2 tsp cinnamon or 1 cup mini chocolate chips or 1 cup roasted pistachios, finely chopped. Cheese wafers are a classic Southern staple, especially at the holidays. Whenever I'd travel to Louisiana to visit family, I could always anticipate finding a plate of these at any one of my relative's homes. It wasn't until my Mom moved to Tennessee that she discovered this variation on the cheese wafer, with the unexpected-but-delightful ingredient of...Rice Krispies! In the bowl of a mixer, cream the butter and cheddar cheese. Add flour, salt and cayenne and mix well. Add in Rice Krispies and gently stir in until fully incorporated. Shape the dough into small balls (about 1 tsp) and place on an ungreased cookie sheet. Flatten each ball with a fork and bake at 350 for about 15 minutes. These don't get brown - so be careful not to overbake. These are a lovely cross between candy and a cookie, with hints of citrus and cardamom. They look so fancy and elegant and would make for a perfect after-dinner treat, served with coffee or tea. OMG - these were pretty much my favorite cookies of the whole bunch. What's not to love with hazelnut shortbread cookies filled with homemade nutella? While I gave away most of my cookie haul as gifts, I kept all of these for myself (sorry, not sorry!). If you love the flavors of coconut and caramel - these cookies are for you! They are an easy 5-ingredient cookie that come together in one bowl - and can be made in advance. These French cookies are dairy free and just four simple ingredients. As a lover of anything almond flavored - these cookies weren't almond-y enough for me. I would add a bit of almond extract to amp up the almond-ness of these cookies. These cookies have it all: looks, taste and chocolate! And not just one kind of chocolate...three! (technically four, if you count the semi-sweet chocolate shavings on top). The white chocolate glaze is really the shining star in this cookie - the smooth, creaminess of the glaze is the perfect pairing for a rich chocolate cookie base. Klare got very creative in the kitchen with her cookies - making little tweaks here and there to make these cookies her own. She also figure out how to be the most efficient with shaping and baking her cookies...all of these are slice and bake cookies. It's amazing how different they all look - round logs, square logs, spirals and layers. They're quite pretty and the flavors of each one are unique and so delicious. The bullseye peppermint cookies taste like there's a peppermint patty hidden in the middle! These are just delicious...and dangerous! It's much too easy to knock out four or five of these little one-bite cookies in the blink of an eye! The soft and tender shortbread cookie and the pool of ducle de leche with the sharpness of sea salt all make for a winning combination. Another call for almond lovers - these almond and cinnamon cookies get an extra dose of cinnamon when they're rolled in a cinnamon & sugar mixture right before baking. These cookie bars have some of my favorite things layered one on top of another: crust, caramel, chocolate and nuts. And they play together nicely in this cookie playground. In a sea of round cookies, these triangle treats will surely stand out on any cookie platter! I think in the world of fruitcake, you're either a lover or a hater. I happen to fall in the latter camp - but my Mom LOVES her some fruitcake - so she was very excited to try these. These cookies do require some advance planning - first you have to make your candied fruit mixture and let it sit overnight before you prepare the cookie. So when the day was done, we sampled 18 different kinds of cookies. 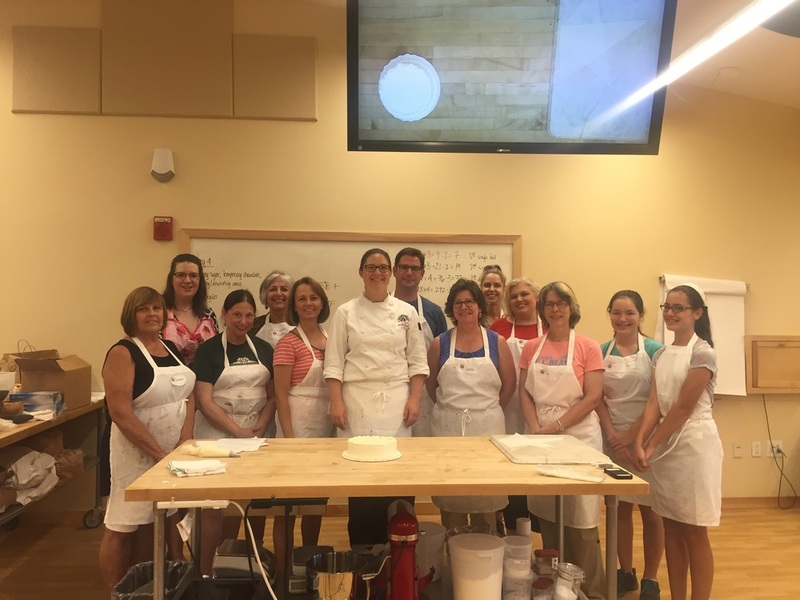 I loved the diversity of flavors, ingredients and techniques but most of all enjoyed sharing this time with my fellow bakers. So which ones are you going to put on your Christmas baking list for this year? It's never too early to start planning...after all, Christmas is just 216 days away!! I'm writing today from sunny (but windy) Rehoboth Beach, Delaware. I'm on a retreat with women from my church and having a wonderful time relaxing, praying, playing games and of course, eating! I signed up for making breakfast for our group this morning - and had two recipes in mind to make: scones and an overnight crockpot casserole. When I first came on this retreat, I made buttermilk scones, using a recipe I had gotten from my bread baking class at King Arthur Flour. As soon as they came out of the oven, they were devoured in less than 10 minutes and I was told I wasn't allowed to come back on future retreats unless I brought these scones with me. So for three years running, these scones have made an appearance, and if you're not on time for breakfast - you'll be out of luck! The other recipe I made for breakfast is a spinach, sausage & egg casserole. I've been making this recipe for years - but recently converted it to be made in a crockpot to feed a large group of people. It's so easy to assemble the night before and makes your kitchen smell amazing when you wake up. See below for the recipes! In a large bowl, whisk together the dry ingredients. Note: if you're using buttermilk powder, add it in with your dry ingredients - don't mix with the water. Using a pastry cutter or working quickly with your hands, cut the butter into the flour mixture. Mix in the cinnamon chips, chocolate chips or currants. In a small measuring cup, add the egg yolk and enough buttermilk (or water if using buttermilk powder) until you reach 3/4 cup. Gently stir in liquid mixture just until the dough comes together. You might need to use your hands to bring it all together. On a lightly floured surface, briefly knead the dough. Flatten the dough into a disk about 3/4 inches thick. Transfer to a baking sheet lined with parchment paper. Cut into eighths and separate the wedges slightly. Whisk the reserved egg white and brush the tops of each wedge. Sprinkle coarse sparkling sugar over the top. Note: If it seems the butter has gotten soft during some of the previous steps - chill the dough in the refrigerator for 15 minutes before baking. Bake for 15 to 18 minutes, until lightly browned. In a large crock pot, mix together potatoes, spinach, onions & peppers, sausage and cheddar cheese. Pour egg substitute and milk over the potato mixture and season with salt and pepper. Mix well. Cook in crockpot on low setting for 6-8 hours.